The film crew are on safari and have spotted lots of wild animals, including an ostrich, a hippo, a giraffe, a leopard, an elephant with its baby and even a dangerous crocodile with a fish in its mouth! And when the sun goes down, the crew love sitting around the fire talking about what they’ve seen. 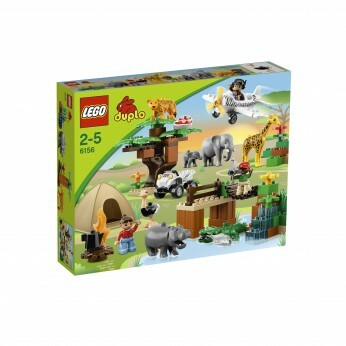 Includes 8 LEGO DUPLO animals and 3 DUPLO figures: 2 men and a woman…. The film crew are on safari and have spotted lots of wild animals, including an ostrich, a hippo, a giraffe, a leopard, an elephant with its baby and even a dangerous crocodile with a fish in its mouth! And when the sun goes down, the crew love sitting around the fire talking about what they’ve seen. LEGO model number: 6156: Includes 8 LEGO DUPLO animals and 3 DUPLO figures: 2 men and a woman. Size H37.8, W48, D9.4cm; Weight 1423g; For ages 2 years and over; EAN: 5702014833470 . * 3973763 44.99. This toy costs approximately £41.99 (for the latest and best prices make sure you check our retailer list for the LEGO Duplo Photo Safari 6156 above). In our review of LEGO Duplo Photo Safari 6156 we classed it as being suitable for ages 6 years, 7 years, 8 years, 9 years, over 10 years but recommend you check the manufacturer specific advice before purchasing.